1. Combine the pork chops, garlic, oil, mustard and lemon zest in a bowl; toss well to coat. Refrigerate 1 hour. 2. Heat a grill pan over medium-high heat. Sprinkle pork chops with salt and pepper and place in pan. Cook, until well marked and cooked through, 6 to 7 minutes per side. Transfer to serving plates and keep warm. 3. Meanwhile, combine the parsley, peanuts, basil, garlic and lemon juice in a food processor. Process until chopped, about 1 minute. With the machine running, slowly drizzle in the oil until combined. Add the cheese and pulse to combine. 4. 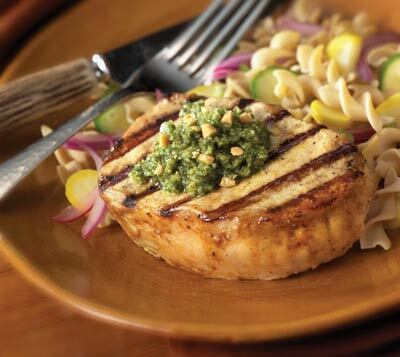 To serve, top each pork chop with 2 Tablespoons of the pesto. Refrigerate remaining 1/2 cup pesto in the refrigerator for up to 1 week. Serve it as a spread on low-carb bruschetta or tossed with a bowl of low-carb pasta.